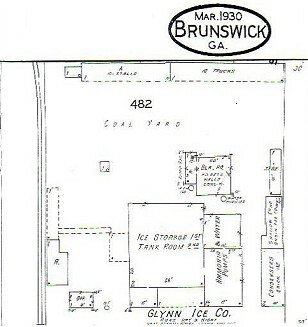 The Glynn Ice Company was established and incorporated in 1903 by R.C. Baumgartner. At its conception the company originally operated on Grant St. During those early times demands for the horse and buggy delivered block ice were high. The company was very important to the residents daily lives by providing ice, as our refrigerators and freezers are for us today. As the county grew, so did demands. In 1907 the operation expanded with a new and larger two story structure on the North end of Newcastle Street. Daily output production capacity could provide 75 tons of frozen block ice! In 1912 F.D.M. Strachan [ pronounced Strawn] took over the company. At that time the telephone numbers were listed as Tel 21 and Tel 39. 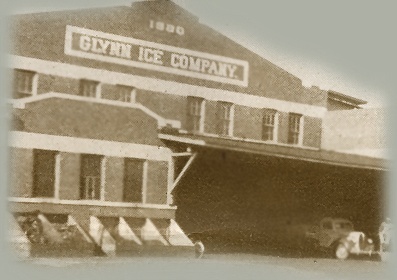 In 1920 with ever growing demands for ice, the company expanded and moved its operation to its current location on George Street. Coal, another important necessity was added to the product line. The coal was brought in by a railroad spur from Cochran Avenue (now MLK) Ice and coal were delivered daily to Glynn county residences by horse & wagon as well as trucks. In 1930, F.D. Aiken, the president of Brunswick Bank and Trust took over the operation. During that time the company changed its name to: Glynn Ice and Coal Company. The blueprint below shows the layout of the operation at that time. In 1944 Mr. Aiken passed company responsibilities to his son, I. M. Aiken. With modern appliances available, the consumer market for ice and coal were in sharp decline. The main ice consumers and the bulk of sales came from local shrimpers as the boats were not equipped with refrigeration systems. In 1963 Hugh K. Tollison took over as president until 1972 when he passed it to his son Ken Tollison. In 1976 the company was sold to Party Time Ice Company and they eventually closed down operations in 1982. The abandoned building fell into ruins with most of the wood part of the structure imploded into the enormous load bearing brick shell. 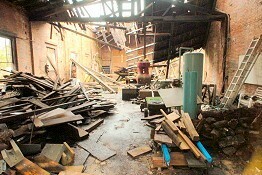 The city of Brunswick had 'condemned' the structure and scheduled it for demolition. 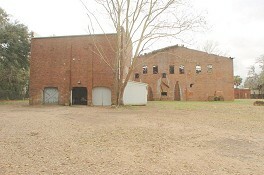 In 2001 Keith Missildine presented a plan to the city fathers to acquire the building to salvage and preserve the structure for a restoration project. After approval, restoration commenced in 2002 for 30% of the building. In 2003 that thirty percent of the building was restored as a residence and occupied. In 2004 the home received a first place on the historic tour of homes and was awarded an Excellence in Preservation by the Brunswick Preservation Association. 12 office condominiums professional building.